Whatever feel you want to create in a given environment, the right fireplace can almost single-handedly create that feel. Whatever your ambition, we can create just what you are looking for. 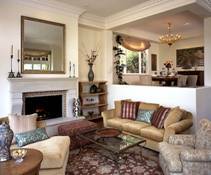 Surround yourself with the splendor of natural stone fireplace. e can think of no other element of interior decoration that can distinguish a home more than the artistic fireplace. For centuries this element has made the means to warm the house an attraction that also warms the hearts. Natural stone can never be molded— it can only be carved and is therefore always original.